Here at Archives and Rare Books Library, we have the Progress Photographs of the construction of Union Terminal that were organized by the Cincinnati Union Terminal Company. The Engineer of Construction was George P. Stowitts. The photographs show views of the different phases of construction from the beginning to the end of the project. These albums are available for viewing upon request. Cincinnati Union Terminal was one of the last great train stations built. It was a significant development in the history of Cincinnati transportation and has become an icon of the city. The building project started in August 1929 and was completed on March 31, 1933. Having 94 miles of track, Union Terminal cost $41 million to build. It was built to accommodate 216 trains per day for 17,000 passengers daily. Passenger train services ceased in 1972 and started up again in 1991 when Amtrak took over train operations at the station. February 1932: Starting to look familiar? Union Terminal was built to replace the hectic railway systems that were already in existence in the city. These five stations were cramped, difficult for connections, and did not handle inclement weather well. When the river flooded, the tracks would often end up underwater so that the stations would have to shut down. Because connections from one train to another were difficult, it made travelers of the train avoid Cincinnati. These issues were made even more apparent after World War I when troop movements highlighted the poor passenger rail situation. Freight operations were also scattered and frantic. To consolidate the system, a plan was created to develop one main train station: Union Terminal. 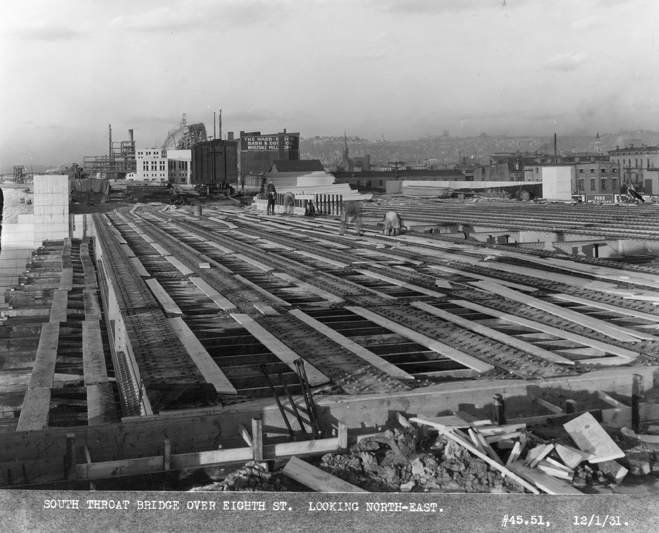 The location chosen was a site east of Mill Creek in the West End of the city, where there was an open space ready for development where tracks and facilities were already in place from some of the other railroad companies. The valley was also wide enough for future expansion, should that desire come about. Mill Creek was cheaper than some of the other locations that were considered, such as right in the heart of downtown. Just before the stock market crash in 1929, ground was broken. 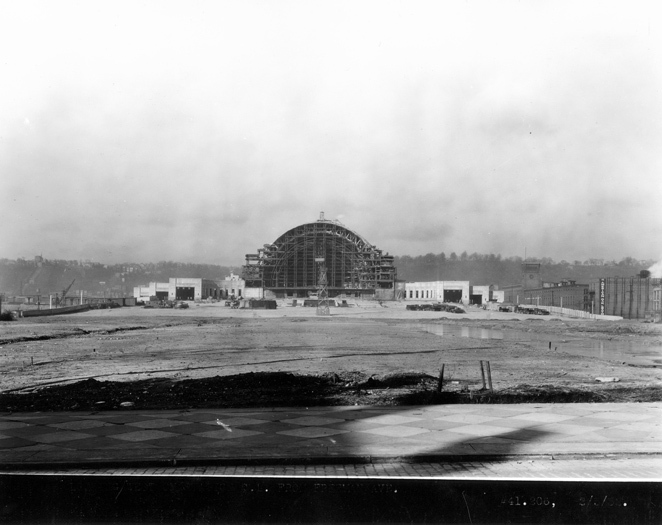 Nine months ahead of schedule, Union Terminal opened in March of 1933. The local and national press described this new station as a “Temple to Transportation,” for it was considered to be one of the finest stations ever built. As soon as a passenger stepped inside, there were more shops than one could imagine and even an air-conditioned movie theater. Lounges, bathtubs, and barbers were available for travelers with a long trip. Much like modern day airports, incoming vehicle traffic was split three different ways to make things more organized. There were ramps for taxis and cars, buses, and the third was for streetcars. The streetcar line was never actually connected and utilized. Because Union Terminal was built during the depression, there were fewer and fewer people traveling by train. To make things more complicated, the Ohio River flooded to its most extreme and disastrous level in 1937; the river crested at 80 feet, making Union Terminal an island amongst all of the water. To recuperate, the tracks were raised in an attempt to protect them from becoming completely submerged again. When World War II began, troops again started to utilize the railways. In 1941, the first Troops in Transit Lounge of the United Service Organization opened in Union Terminal to care for the heightening number of troops traveling by rail. By 1944, as many as 34,000 people were going through the station every single day. After the war, passenger train travel started to rapidly decline. Airways and highways became the travel method of choice. By 1972, Union Terminal closed as a train station; only 2 trains per day were passing through the station that was designed for 216 each day. Union Terminal Color Slide Collection. An aerial view of Union Terminal, circa 1970. Even though Union Terminal declined as a passenger rail station, in 1968 the Cincinnati Science Center installed exhibits inside. Seeming as if the building was destined for failure, even this had to close two short years later. In 1971, Amtrak gave the building a third chance but moved to a new, more practical location on River Road. 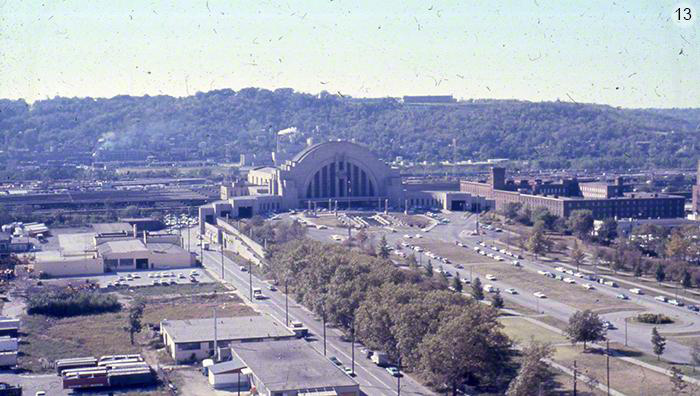 In October 1972, the last passenger train departed Union Terminal’s grand station. The train concourse was demolished in 1974. Hope again took root in 1990 when the facility re-opened. Union Terminal now featured the Cincinnati History Museum, Museum of Natural History and Science, Cincinnati Historical Society Library, and the Robert Lindner Family OMNIMAX Theater. In the same year, Amtrak also reinvested in the station with the Cardinal Line, a track running between Chicago and Washington D.C.. Also located at Union Terminal’s Museum Center is the Cincinnati Railroad Club, formed in 1938. Its permanent headquarters is located in Tower “A” of Cincinnati Union Terminal. After facing many hardships, Union Terminal has finally been established as one of the premier arts and cultural organizations in Cincinnati. For more information about the Progress Photographs on Union Terminal or anything else that Archives and Rare Books Library at the University of Cincinnati has to offer, feel free to search our library catalog at http://uclid.uc.edu/search/X or contact us at archives@ucmail.uc.edu, 513.556.1959, or visit us on the web at http://www.libraries.uc.edu/libraries/arb/index.html. We are located on the 8th floor of Carl Blegen Library.